SCENE: Mitch BERG is sitting on his porch, working on his next book project. Avery LIBRELLE walks through the gate from his back yard and toward the sidewalk. BERG: Um, hello, Avery? Hanging out in my back yard, were we? LIBRELLE: Oh, I was sorting your trash. LIBRELLE: No. Evidence of thoughtcrime. BERG: Huh. I burn all of that. LIBRELLE: Hah! There’s some evidence of thoughtcrime! LIBRELLE: Hey – speaking of thoughtcrime – Ben Carson is a hypocrite. He speaks out against welfare – but he and his mother used it! LIBRELLE: Yeah! Hypocrite! His entire success was rooted in the welfare system! Hypocrite! BERG: Well, if his entire success was rooted in the system, then every child growing up on welfare would be a doctor or a lawyer, wouldn’t they? LIBRELLE: He’s still a hypocrite! LIBRELLE: That’s a stereotype! Trigger warning! Trigger warning! BERG: No, fallacy. It’s a Tu Quoque Ad Hominem – saying that because someone has ever said, or done, or believed something that’s at odds with their argument, their argument is invalid. It’s like saying because someone was once in the Klan, they could never speak out against the Klan. LIBRELLE: But he’s not a former Klan member! His mom was on welfare! He grew up in the system! It made him what he is today! BERG: So you’re claiming credit for Ben Carson’s success on behalf of the welfare system? Fair enough. Will you claim “credit” for all the people of all races who’ve become multi-generational dependents of the system? LIBRELLE: There is no such thing! The science is settled! BERG: Of course it is. Look – what you are saying is this; if someone’s ancestors went on welfare, to which they are entitled – because welfare is, for better or worse, an entitlement in this country – and that person not only uses the system exactly the way it was intended to be used, but goes on to succeed far above and beyond any rational expectations, that person isn’t allowed to point out what an exception to the rule he is, and how the welfare system as it is today *harms* the upward mobility that he experienced? In other words, if you’re born into the system, don’t care speak out against the system, because the system owns you and everything you are, think and believe, forever? 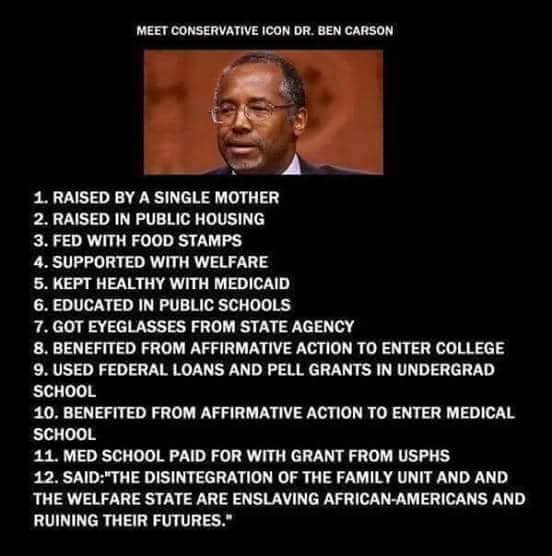 Doesn’t that pretty much prove Carson correct? That you, the system’s supporter, are using it as a form of intellectual indentured servitude? LIBRELLE: Steven Colbert! John Oliver! Rachel Maddow! Neil DeGrasse Tyson! This entry was posted in Campaign '16, Chanting Points Memo and tagged Dramatization by Mitch Berg. Bookmark the permalink. I would say (without doing research), that Dr Carson isn’t calling for an end to public schools, total elimination of welfare, fed’l loans, etc. Just a reform of an expensive broken system. He’s the exception for those who go through the above systems. 4. Men who desert their children should have the BaLLz their kids are forced to suk removed from their own bodies. 5. There is no one you can count on but you to make your life happy and successful. Of course now, to make it more appealing, leftist slobs have removed any trace of those lessons, which is why so many people pass the welfare gig on to their kids. I’d bet my next year’s salary that Ben learned ’em before they got stuffed under the rug. Fuk Leftist Slobs….in case I haven’t said that lately.